�Lavendula Vera. It is a well-known, small, rubby, perennial plant, a native of the South of Europe, andultivated in our gardens for the sake of its perfume. Its flowers contain a volatile oil, stained by distilling. It is warm, aromatic, and carminitive. is used as a stimulant in debility, lowness of spirits, and her nervous affections. It invigorates the stomach, and removes obstructions from the liver and spleen. The oil is goodfor toothache. The distilled water removes hoarseness, loss ofvoice, faintings, trembling, etcetera. It removes obstruction of urine,and flatulency. 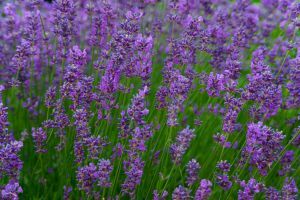 The Oil and also the Compound Tincture maybe obtained at the shops; the latter preparation is known by the name of " Lavender Drops," which are very useful in languors and faintings. It is a useful addition to stomachic in�fusions, as infusion of gentian, cascarilla, etcetera. The oil of Lavender, with equal quantities of Lard and Butter of Cocoa, makes a good application to stimulate the growth of the hair.